Obviously, the standard pie crust just doesn’t do it for me. And a graham cracker crust would be a little too sweet, I think. So instead I used gingersnaps and came up with this recipe for Pumpkin Gingersnap Pie. And it was crazy good! While it does make the Weight Watchers Crustless Pumpkin Pie a little less virtuous, it’s still lower in calories than a regular pumpkin pie. 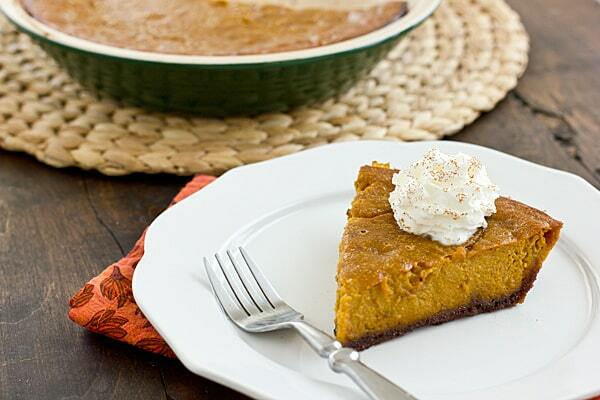 A lighter version of pumpkin pie with a gingersnap crust. Pulse gingersnaps in food processor until they form fine crumbs. Stir in melted butter. Spray 9-inch deep-dish pie dish with cooking spray and press crumbs into bottom. Combine pumpkin, milk, egg whites, salt, pumpkin pie spice, vanilla, and sugar in a large bowl and beat until smooth. Pour mixture into pie dish. Bake at 400 degrees for 15 minutes. Lower oven temperature to 325 and bake for 45 minutes more, or until knife inserted into center comes out clean. Cool on wire rack. This looks REALLY good, but I have to disagree on your crust feelings. I loooove pie crust… it just has to be done right! do you normally cook your pie crust a bit before you fill it? REALLY? Ew. I thought everyone hated pie crust! I’ve never made it myself, but I’ve had homemade (that other people have made), store bought, fresh from the bakery–doesn’t matter where it’s from, I never like it. Boy all these pumpkin recipes really have me wanting to try them. This is one of my favorite crusts for pumpkin pie – so good! Sometimes I’ll even add finely chopped bits of crystallized ginger for extra bite. I really thought this was a semi-original idea, but after I made it, I did a Google search for it and it pre-populated for me. Dammit! I was going to garnish the slices with crystallized ginger, but putting it in the crust is an even better idea. YUM! I’m not opposed to crust, unless it is burned. I swear I always singe the crust = yucky taste! Great recipe! LOL we all have different tastes! I So need a food processor. I was crunching oreos for a dirt cake with a rolling pin. I mean…really. Xmas gift idea for me!! I love gingersnaps and pumpkin pie so I will be trying this recipe. Yummy. Thank you for sharing it with us. I will have to try this! Looks really good! Ooh, it would definitely be good with cheesecake. So much for my original crust idea, though. Ha! Yum! I love pumpkin and I’m seeing so many recipes I need to try – thanks for sharing! This sounds so good! I’m going to start making this instead of using premade pie crusts! I think it sounds yummmmmmmmyyyy!! thanks for sharing. I’m loving all of the pumpkin recipes out there! I have been wanting to make all sorts of things pumpkin this month. Must say (as your first commenter did) I love a good pie crust too. That being said, I love what you did with this pumpkin pie… a gingersnap crust sounds like the perfect complement to the spices in pumpkin pie. Yum! Where were you when I finally tossed the bag of gingersnaps I’d bought ‘for some recipe, I saw it somewhere . . . if I keep searching I’ll find it again’ and 5 months later, no recipe. Funny, how you get on the internet looking for one thing and get distracted. This recipe, however, I have bookmarked in my Desserts folder so when I finally buy another bag of gingersnaps I will be ready. Thanks! I made this pumpkin pie last week. Let me start with: I am French, I live in the US, I had never had or made pumpkin pie before. It was a total success, made it for my American friends as we were having a dinner party, some said it was the best pumpkin pied they’ve ever had!! Thank you for this recipe.